In a daring move, Universal Studio's Orlando has re-opened the "Hollywood Rip, Ride and Rockit" roller coaster which gained national attention last night when the ride stranded 12 riders for over 3 hours. Near the top of the lift hill, before the first drop, the ride shut down due to a "technical glitch" in the computer system which operates the ride. 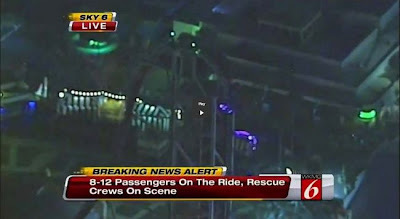 This stranded riders in a nearly vertical position for over 3 hours until ride operations crews and Orlando Fire Rescue was able to move to the roller coaster train into a position to evacuate the riders safely. Surprisingly, less then 12 hours after this ride failure, Universal Studio's has re-opened 'Hollywood Rip, Ride and Rockit' to the public around 10am this morning. In a not very comforting nor reassuring statement found on Orlando Sentinel, Universal spokesman Tom Schroder said "I'm not going to detail it, but it has been resolved". To elaborate further he pointed out the typical theme park line heard after they gain attention of a non-flattering form. "The safety of our guests and the experience they have on our attractions is very important to us," he added. "For us, there is no such thing as a routine glitch. We put every resource we have against resolving them.". This sudden push from Universal Studio's to re-open the ride is rather surprising, many expected the more prolonged testing as well as re-evaluation on the evacuation procedures. Many are still trying to figure out why Universal Orlando doesn't have more complete evacuation procedures for the ride which don't require Orlando Fire Rescue to be called in. 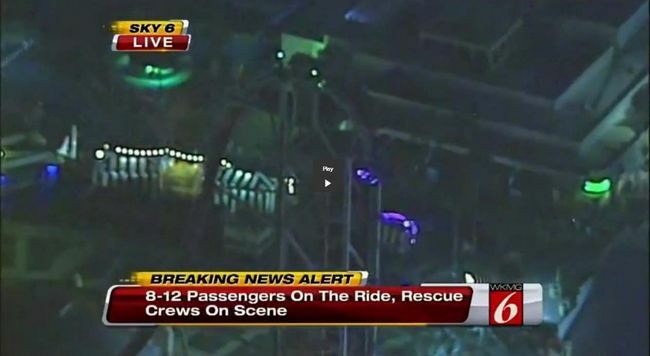 Most Theme Parks and Amusement Parks are well versed in their attractions and are able to evacuate them from any position in which the ride stops. It's obvious that Universal is fully able to manipulate the ride during such an event as a "glitch" to bring it to the proper position to unload the riders safely. Which leaves the question, why was this evacuation any different then others? Personally, I just returned from Orlando and we did ride this roller coaster. I found it overall to be rather uncomfortable and rough, especially the lift hill area where the ride shut down. I can't imagine having to sit there for three hours. I personally believe this sudden re-opening has much more to do with Halloween Horror Nights, which is Universal's primer Halloween event which draws record-high crowds to the park and not much to do with anything else. Universal relies on these rides and attractions to help with crowd control during this very busy event, to have one of the primer attractions down would cause issues with the overall crowd flow in the park (it would make already really long lines for the haunted houses even longer). With such a vague statement about this ride, it's rather hard to say what the future will hold for this ride. Judging from it's history of issues, I'd guess it probably doesn't have much time left.